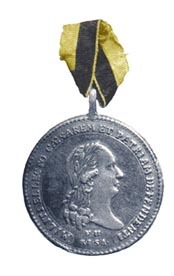 Figure 1: Olmutz Military Medal, silver, Obverse. Image from the author’s archive. 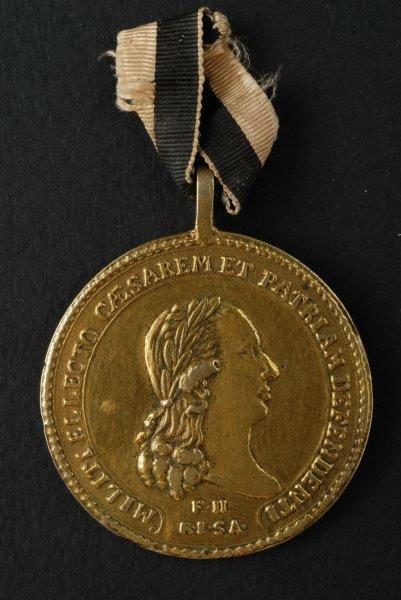 This medal was issued by the Civil Board of the town of Olmutz as an award to ten of its citizens who at the request of the town council formed the Olmutz Volunteer Corp which served as a component of an Austrian Chevau-Legers regiment during the war with France in1796. 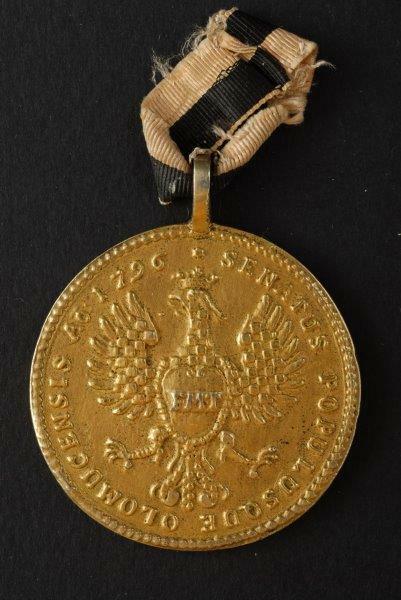 Reason Issued: This medal was issued on August 12, 1796 by the Civil Board of the town of Olmutz as an award to ten of its citizens who at the request of the town council formed the Olmutz Volunteer Corp which served as a component of an Austrian Chevau-Legers regiment. Figure 2: Olmutz Military Medal, obverse. Image from the author’s archive. Obverse: The bust of Emperor Franz II, Facing to the right, with long flowing hair and a laurel wreath on his head. Around the edge of the medal is an inscription in a frame composed of a fine line. The inscription reads: MILITI ELLECTO CAESAREM ET PATRIAM DEFENDENTI . Translation: The soldiers chosen as the defenders of their emperor and homeland. Below the bust is inscribed in two lines: FII/R.I.S.A. (Franciscus II Rex Imperator Semper Augustus) Translation, Franz II Emperor of the Holy Roman Empire. Figure 3: Olmutz Military Medal, reverse. Image from the author’s archive. Reverse: An Olmutz eagle with shield on its breast on which are the letters FMT (FRANCISCVS MARIA THERESIA). This is the town coat of arms as modified in 1758. 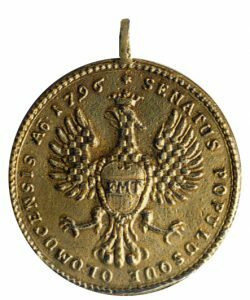 Around the eagle is the inscription: SENATVS POPULUSQUE OLOMUCENSIS AO 1796. Translation, Senate and people of Olmutz in the year 1796. Figure 4: Olmutz Military Medal ribbon as described by Hessenthal/ Schreiber. Image from the author’s archive. Figure 5: Olmutz Military Medal ribbn as described by Mericka. Image from the author’s archive. 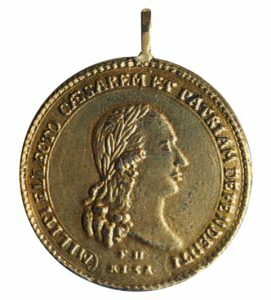 I am glad that also this rather curious and very rare medal would have been described in this interesting section of the OMSA webpage. I would like to contribute with the pictures of the piece present in my collection. This piece is first documented as having been part of the von Heyden Collection; after its presence in some now dissolved collections, I’ve had it in 1996. I will better check in my papers, for further studies and publications re. this award.